New York : Broadway Books, c2011. 374 p. ; 21 cm. 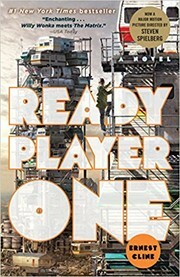 In the year 2044, Wade Watts, like the rest of humanity, chooses to escape reality and spends his waking hours in the limitless, utopian virtual world of the OASIS, but when Wade stumbles upon the first of the fiendish puzzles set up by OASIS creator James Halliday he finds he must compete with thousands of others--including those willing to commit murder--in order to claim a prize of massive fortune. 100 ME:PersonalName 1 $a Personal name Cline, Ernest. $c Statement of responsibility Ernest Cline. 520 Summary $a Summary, etc. note In the year 2044, Wade Watts, like the rest of humanity, chooses to escape reality and spends his waking hours in the limitless, utopian virtual world of the OASIS, but when Wade stumbles upon the first of the fiendish puzzles set up by OASIS creator James Halliday he finds he must compete with thousands of others--including those willing to commit murder--in order to claim a prize of massive fortune.